Background: Production of tumor necrosis factor (TNF)-α by inflammatory cells in lesions is the hallmark of the pathogenesis of rheumatoid arthritis (RA). Regulation of inflammatory responses in knee joints of patients with RA is critical for improving severe symptoms. Flavonoids have inhibitory effects on the acute and chronic inflammatory responses caused by TNF-α. The flavonoid quercetin (QUER) is one of the most prominent dietary antioxidants. 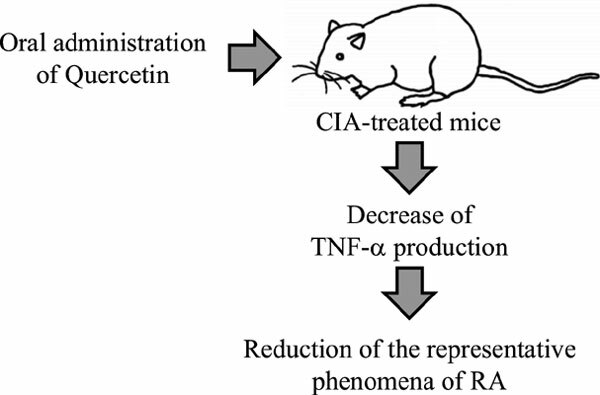 Objective: The present study investigated the preventive and therapeutic effects of QUER on inflammatory responses in collagen-induced arthritis (CIA) in mice. Methods: Mice with CIA, a mouse model for RA, were treated with QUER orally three times a week either from the second immunization with collagen (day 21) or day 28 when symptoms of CIA had developed midway. Results: In both cases, inflammation-related clinical scores of knee joints were significantly reduced by treatment with QUER. Histological analyses showed that the representative characteristics of RA, such as damage to interchondral joints, infiltration of inflammatory cells, and pannus formation, were significantly reduced by QUER treatment. Oral administration of QUER significantly decreases lipopolysaccharide (LPS)-induced TNF-α production in a dose-dependent manner. Expression of TNF- α mRNA in knee joints was decreased in QUER-treated mice, compared with those of CIA controls. Conclusion: These results suggest that oral administration of QUER might effectively improve symptoms of RA. Quercetin, rheumatoid arthritis, inflammation, knee joints, tumor necrosis factor-α, lipopolysaccharide.